It is the sort of lightweight, inexpensive and pragmatic engineering that has made Robinson the world’s best-selling helicopter maker. 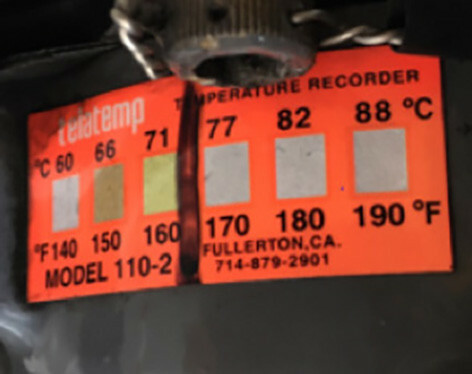 Instead of complicated and expensive electronic-alerting systems, such as temperature warning lights in the cockpit, Robinson helicopters use heat sensitive stick-on strips, called telatemps, to detect changes in the operating temperature of critical components. Heat is an early sign of problems that could cause catastrophic failure of a component. Components fitted with heat-sensitive strips may include the main rotor gearbox, the tail rotor gearbox, the hydraulic pump and the drive belt sheave actuator bearings. Telatemps consist of several individual segments, or squares, which change colour from silver to black as the temperature the strip is exposed to increases. 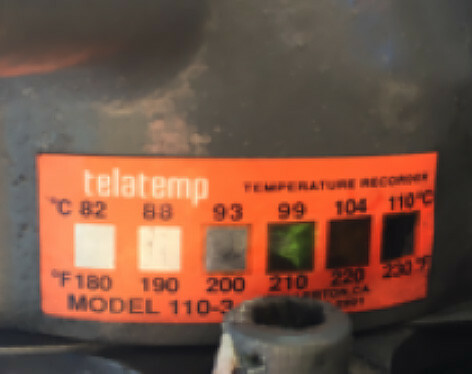 Telatemps come in various temperature ranges, each with a different part number. 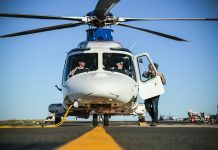 The correct part number telatemp is fitted in accordance with the helicopter’s maintenance manual. It is important to follow the maintenance manual as some components may use interchangeable telatemps depending on the normal operating temperature of the helicopter, for example on the R44 drive belt sheave upper actuator bearing you can fit either a 110-2 or a 110-3 telatemp. 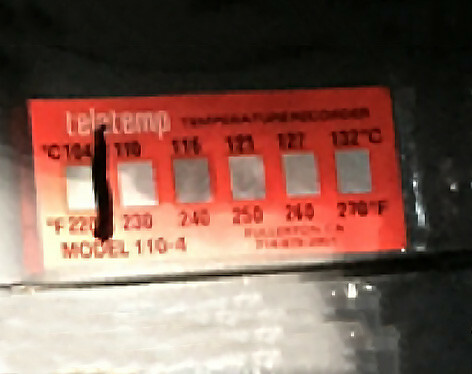 The 110-2 telatemp has a temperature range of 60–88°C and the 110-3 telatemp has a temperature range of 82–110°C. Once a telatemp is fitted by a licenced engineer, the helicopter is run up to normal operating temperatures and then shut down. After shut down, the telatemps are examined and a reference line drawn between the highest blackened square and the next unchanged (silver) square, as shown below. 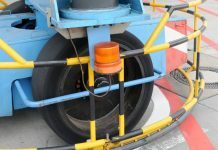 The reference lines are marked by maintenance personnel. 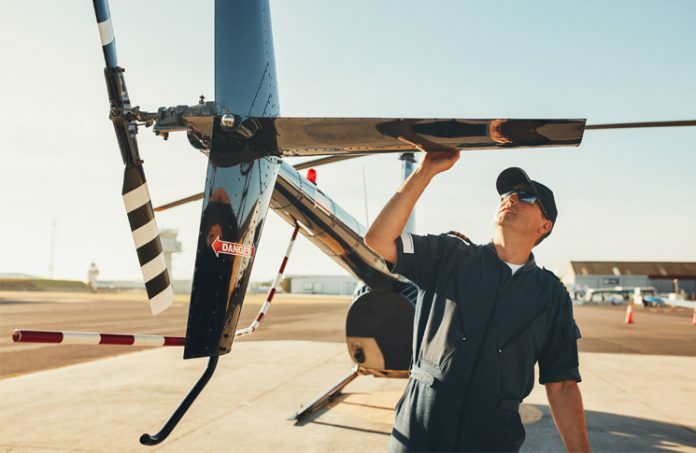 During each pre-flight or daily inspection, the telatemps are checked for any indication of an increase in the component’s operating temperature. Any indication of an increase in temperature, which cannot be explained, must be investigated before further flight. the reference line is a maximum allowable temperature indicator. There have been many other misinterpretations of how to use and read telatemps. 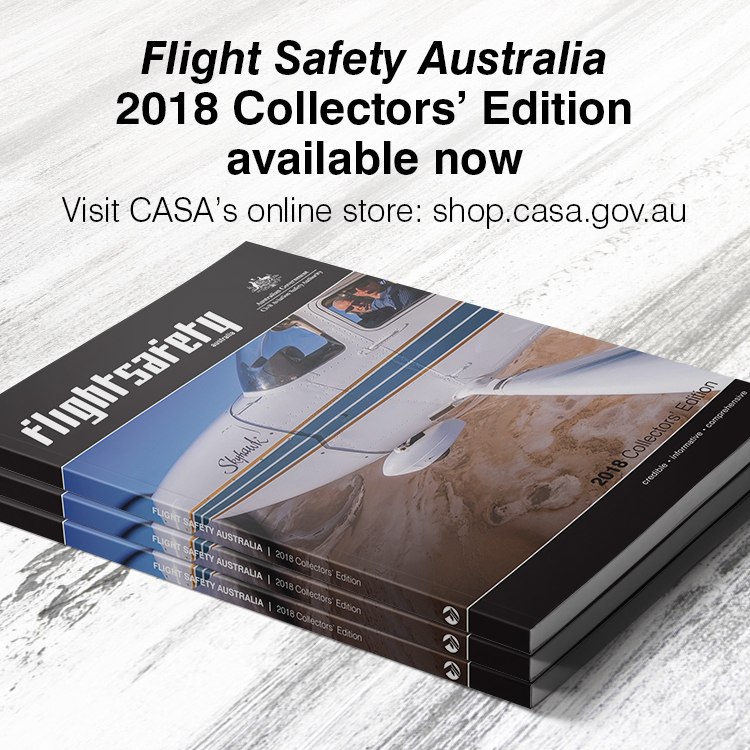 The Robinson maintenance manuals and flight manuals all contain simple and clear instructions on how to mark and interpret telatemp strip indications. Here is a quick pop quiz on various telatemp indications (answers at the end of the article). From the examples found on helicopters in operation, select the appropriate maintenance action (if required). Condition of component unknown as telatemp has no black squares. Component is serviceable however telatemp faded due to weather. Component serviceable as only one square is black. Unexplained black square indicates a temperature rise which needs investigating. Pilot needs to draw a reference line after the 60°C square. Telatemp strip unserviceable and should be replaced. Change to a lower temperature range telatemp. Telatemp unserviceable and should be replaced. Condition of main rotor gearbox unknown. Component condition needs to be investigated. Only telatemp unserviceable as it is reading backwards. In conclusion, telatemps are a device designed to alert pilots and maintenance personnel to possible degradation in the performance of critical helicopter components. Failure to investigate unexplained increases in component operating temperature could lead to catastrophic component failure. Maintenance personnel must install and mark telatemps correctly, in accordance with the manufacturer’s procedures. 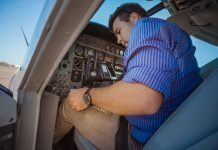 If they are installed and marked correctly, pilots will have increased confidence in the indications on the telatemps. Any unexplained increase in component operating temperature, as indicated by a telatemp, must be investigated. Example 1: C Robinson product support says telatemps may fade due to weathering. If this occurs, the telatemp should be replaced. Example 2: B If no reference mark has been made, you need to presume none of the squares turned black following fitment of the telatemp. Now there is an unexplained temperature rise indication which needs to be investigated. Example 3: C 110-3 telatemps have a temperature range of 82–110°C and, on some components, are interchangeable with 110-2 which have a temperature range of 60–88°C. 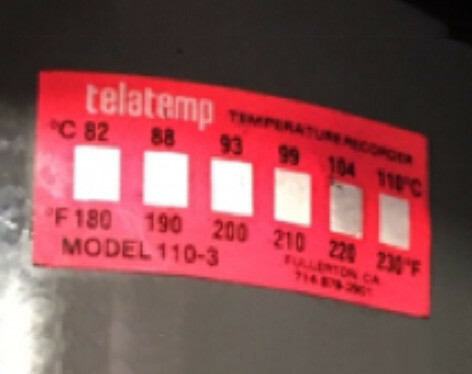 If the higher range telatemp does not indicate within the normal operating temperature, a lower range telatemp should be fitted, if permitted by the maintenance manual. Example 4: A Component is serviceable, however the 104°C square has faded. The telatemp should be replaced. Example 5: B The component’s condition is unknown. As there is no reference line on the telatemp, you must presume no squares were black after the telatemp was initially fitted. Now the highest square is black. The reason why the highest square has turned black needs to be investigated before further flight. The telatemp appears to be reading backwards due to the lower temperature squares fading. Note: This photo was of a telatemp fitted to the tail rotor gearbox of an R44. 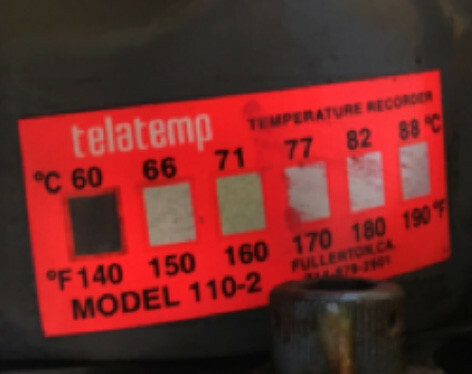 It is the incorrect part number, and therefore incorrect temperature range telatemp. The correct telatemp for an R44 tail rotor gearbox is a 110-2, which has a temperature range of 60–88°C.